I've got the cupcake skills.....carrot cake w/ cream cheese frosting..
that looks delicious ladies. my goodness! i will have to try this recipe. 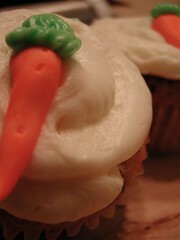 i love carrot cake but have never tried to make the cupcakes. I have tried to make Italians to like them, but it seems rather a difficult task!